Nowadays high-performance estate models are revered and loved by car enthusiasts, proven by the success of the FR and Cupra versions of the current SEAT Leon ST. But in the ‘70s cars with a fifth door, generous load space and easy access lacked the dynamic image that we take for granted today. So imagine the shock on the average Spanish driver when in mid-1974 SEAT launched a Familiar (or estate) version of the 1430 saloon powered by the 1.6 litre twin-cam engine of the 1430-1600 (known as the FU). At the time it was the first Spanish-built sports saloon, delivering 95PS and weighing only 980kg, giving its a top speed of 105mph. At the time, performance figures that no one would have put next to a sedate looking estate car. The 1430 Especial 1600 Familiar (type FM) was so far ahead of its time that commercial success was difficult to come by as the domestic market still wasn’t ready for a vehicle that was the ST Cupra of its era. Only 852 examples were made between 1974 and 1976, when production stopped. It was replaced by the SEAT 131 estate, powered by the same engine but bigger and heavier, making it far less fiery. The SEAT 850 Sport was the first niche car produced by SEAT. It also back in 1969, the same year the 1,000,000th car built by the Spanish car maker left the Barcelona assembly line since 1953.
version of the new Ibiza in the mid-80’s. Only 1,746 examples of the SEAT 850 Sport Spider were built when production ended in 1972, and it holds a unique place in SEAT’s history. 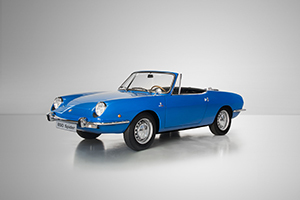 With no successor, the Spider was the first and only production convertible ever built by the brand, a symbol of what SEAT could make possible but also a sign of how the Spanish carmaker and its domestic market had developed, with increasing demand for more mainstream vehicles.